The Force Fighter Green is an Event Mouse found during the annual MouseHunt Birthday event. Information on how to locate and capture the Force Fighter Green can be found on the current MouseHunt Birthday location page. 7 March 2013: The Force Fighter Green was first released for the MouseHunt's Fifth Birthday event. 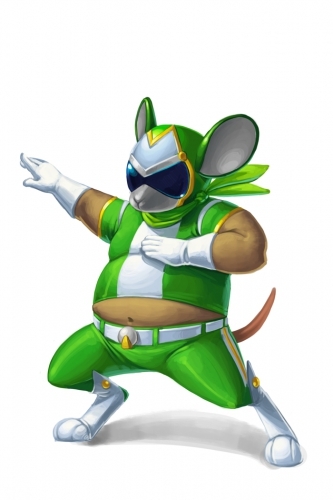 During MouseHunt's Fifth Birthday, the Force Fighter Green could not be attracted when the Limited Edition Ultra MegaMouser MechaBot Trap was equipped. The appearance and description of Force Fighter Green are a play on the popular cartoons Speed Racer and Mighty Morphin Power Rangers. This page was last edited on 9 April 2017, at 00:32.